Jones’ father subsequently started a crowdfunding campaign to develop a mobile app that would allow film and TV crews to anonymously report unsafe work conditions before those conditions resulted in injury or death. Safety apps are quickly becoming a mainstay in the workplace, from movie sets to construction zones, factories, school buildings, and healthcare facilities. 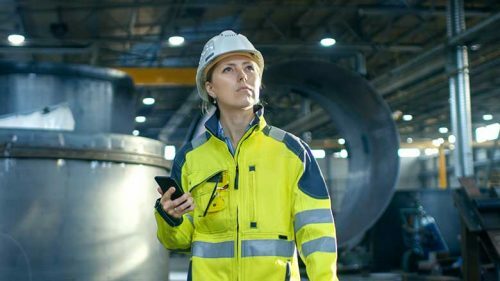 Students earning a Bachelor of Science in Occupational Safety can expect to enter a field that is embracing the usefulness of mobile device technology. At first, the presence of mobile devices at the workplace seemed to present more problems than solutions. A 2011 survey conducted by Harmon.ie revealed that 60 percent of work interruptions involved tools such as email, social media, and text messaging/instant messaging. The same survey revealed that 45 percent of employees work only about 15 minutes in between such distractions. Findings like these prompted many businesses to restrict mobile device usage during work hours. Lifting Equation Calculators – Takes into account a number of different variables and determines safe manual lifting weights in an effort to cut down on work-related musculoskeletal disorders. Chemical Hazards – Offers a complete reference for any and all chemical hazards along with links to important information, World Health Organization (WHO) documents, and Emergency Response Guides. Ladder Apps – Provides reference information for safe extension ladder angles, correct positioning information, and even fall alerts utilizing GPS and accelerometer technology. Heat Safety Tools – Uses heat indexes used to calculate risks for outdoor workers, allowing for alerts to be set up to remind workers to drink fluids, take breaks, and monitor other workers for signs of heat-related illness. OSHA Mobile – Lets workers check constantly to make sure that all OSHA standards and being followed and that the business is complying with regulations. First Aid Apps – Makes life-saving first aid information and tutorials accessible in a concise manner to help with workplace incidents. Noise Level Alerts – Identifies dangerous decibel levels, helping workers know when to use hearing protection while working. Fatigue Predictors – Uses mathematical models to weigh variables and determine whether a worker is in danger of suffering a fatigue-related incident. Safety Compass – Uses workplace conditions programmed into the compass, along with a location-based, augmented reality service, to warn workers of potentially hazardous conditions nearby. Incident Cost Calculators – Estimates costs associated with health and safety incidents in the workplace, based on sample and average information from a range of similar industries. Continued development of augmented reality technologies, along with artificial intelligence programs, data analytics, and robotics, will make the workplace of the future both more efficient and safer for human beings. MIT’s prototype devices detect falls from distances high enough to cause serious injury or death, sense exposure to dangerous physical or chemical agents, and notify emergency personnel when a worker is down, even if the person is working alone. Respiration sensors, carbon monoxide detectors, combustible gas sensors, and air quality measurement devices are all built into a vest or jacket that can be worn by workers who may come across dangerous conditions. Mobile safety apps are expected to become commonplace in the workplace of the future, and the number of safety incidents across the country will likely decline as a result. Eastern Kentucky University’s online Bachelor of Science in Occupational Safety program helps students learn how to identify and analyze potential workplace hazards, infractions, and risks. Taught by industry-experienced safety professionals, the program is fully accredited and prepares graduates to become leaders in the field of occupational safety. Contact Eastern Kentucky University for more information.